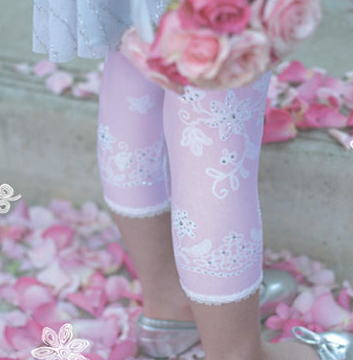 Lace Icing and Sprinkles leggings by Angela Frost are oh so sweet! Vintage inspired and adorned with gorgeous detailing make these leggings one of a kind. They are capri length and come in 8 different colors perfect for matching up with dresses, skirts or tops. Each comes gift boxed with cream ribbon and a beautiful butterfly gift card. Visit Angela Frost for a list of American and International retailers.